These four renovated floors in the Chelsea neighborhood of Manhattan are the new EILEEN FISHER Design Center. North River adapted many materials from previous EILEEN FISHER offices for re-use in this LEED Gold renovation project, providing sustainable, work-friendly spaces for 29 different teams in this renowned American fashion brand. This design concept highlights the newest iteration of the brand's mission to design and produce the most environmentally and socially responsible clothes in their industry. Our core design concept of acoustic wall systems accommodates EILEEN FISHER’s new WASTE NO MORE line of felted textiles from their own recycled garments as well as design pin-ups, merchandising and photography. The company’s goal of balance between privacy, flexible-teaming, and an open-plan layout was achieved with a broad range of working, meeting, and informal activity spaces throughout the center. 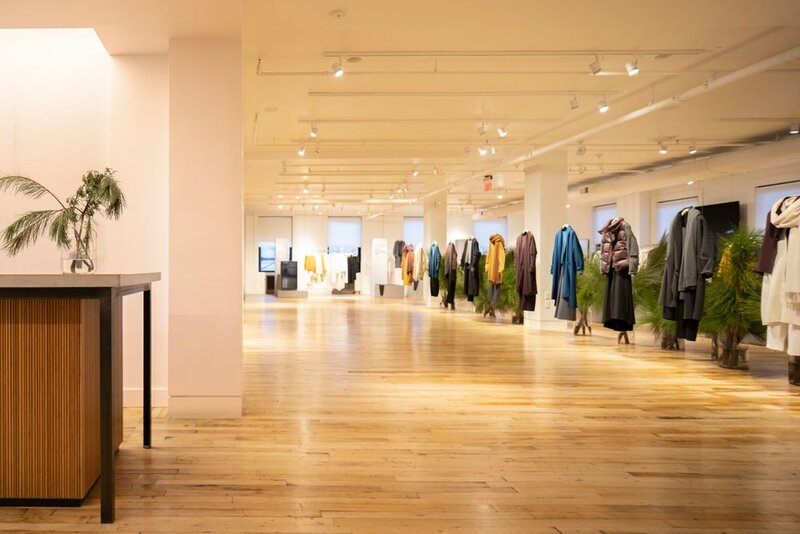 A new state of the art showroom looks over Fifth Avenue, where sales and meeting rooms with moveable walls and retractable garment racks help the brand achieve the broadest range of retail, showroom, event, and merchandising uses. North River brought to life this concept of open, flexible spaces, evoking a modern brand sensibility within a century-old landmark building. Challenging project components included creative structural engineering, advanced mechanical, electrical and data systems, and rigorous acoustical controls for employee wellness and productivity, all integrated effectively into the historic architecture of the building on a realistic budget. Our team also devised a complex construction schedule allowing the project to proceed around EILEEN FISHER’s continuous use of the space. We are proud to have contributed to this project in full, from conceptual planning through comprehensive Construction Documents, permitting, Construction Administration and interior design.